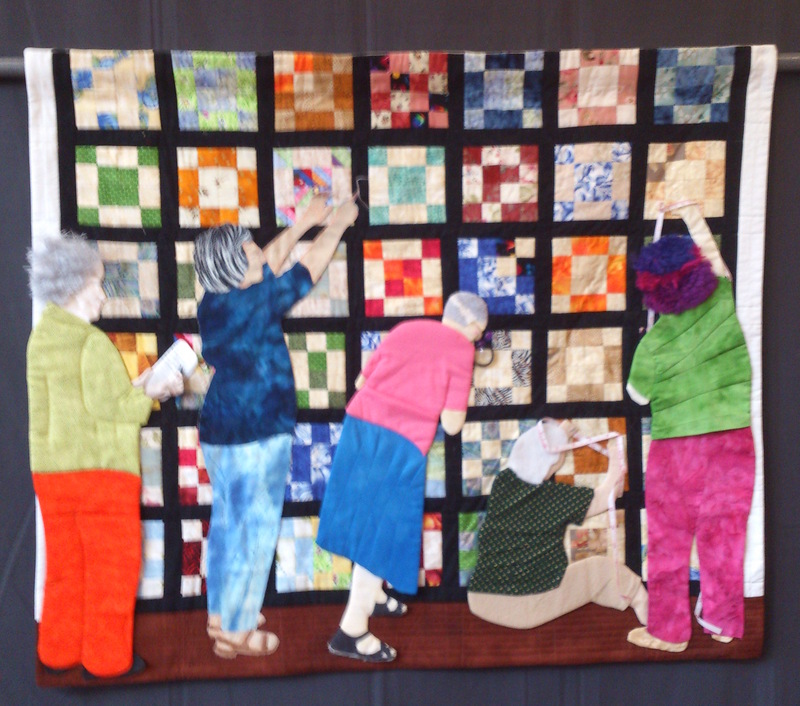 Quintessential Quilters With an Abundance of Talent. 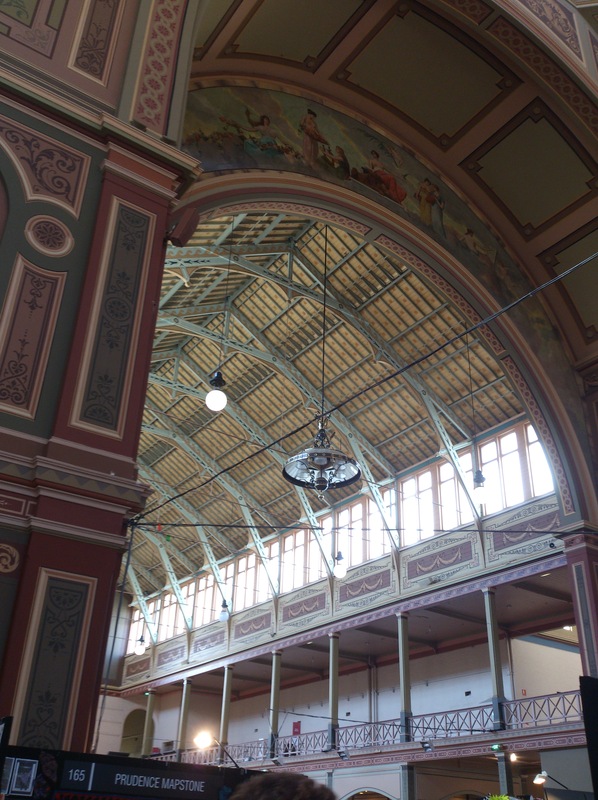 I was privileged (and gobsmacked) to attend the Australasian Quilt Convention on Sunday 19, 2015, at the Royal Exhibition Building, Melbourne. A memory day with delightful company ( thank you DF and CG) plus unforgettable images. I left with an increased appreciation of the amazing talent of many people – my older sister, Cate included! In a world where we are bombarded daily with doom and gloom, it’s important to seek joy and immerse yourself in beauty and see the constructive side of humanity, whenever possible. Motivated to see Cate’s entry in the Lest We Forget Challenge organised by the AQC to commemorate the centenary of the ill-fated WW1 Gallipoli Campaign, D and I caught an early train into the city and walked up from Parliament Station. The free travel for seniors on a Sunday a price hard to beat. There is no excuse for Melburnians not to explore their city by public transport on the weekends because even for others the travel is cheap. 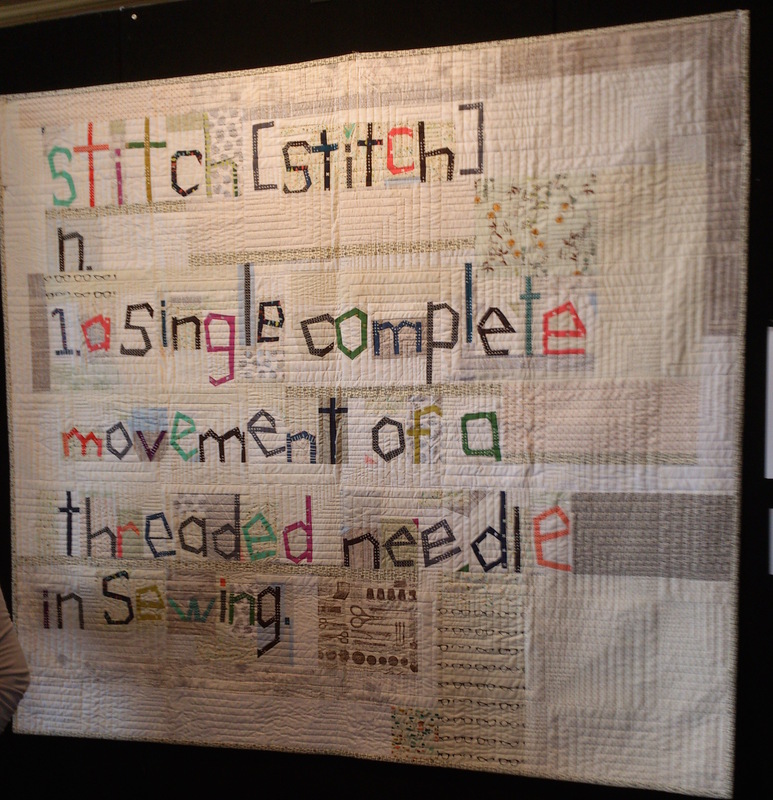 Arts and Crafts really grew as an arts movement in the 19th century, but sewing patchwork and quilting has been around a lot longer. As a skilled activity it is growing in popularity in our society, probably because people have more leisure time and disposable cash, to turn what were items of necessity into beautiful works of art. 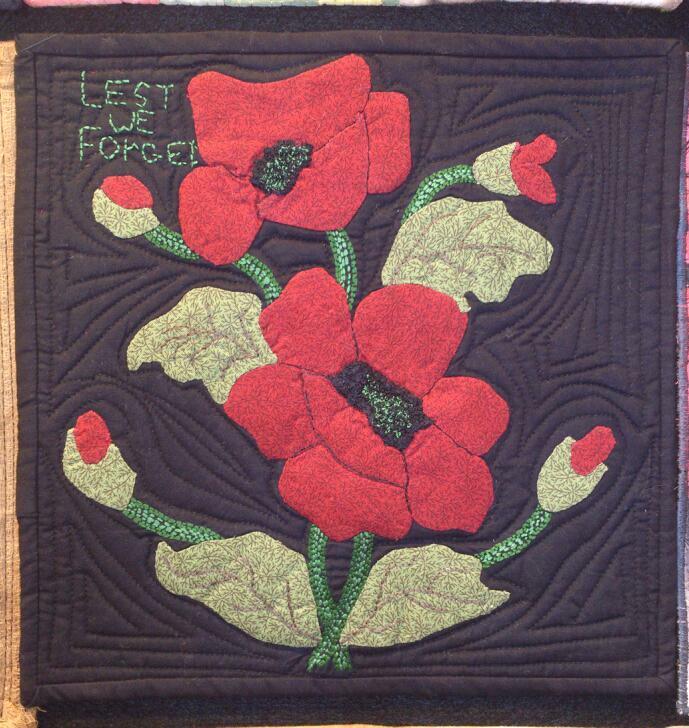 These slide shows of the other entries in the Lest We Forget Challenge show just how creative and beautiful quilts can be. The grand venue perfect for the convention. 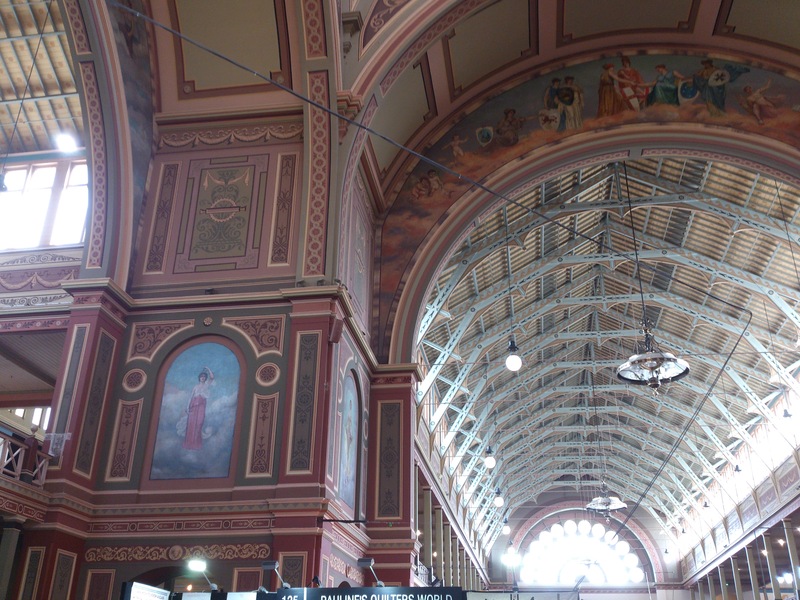 Magnificent 19th century architecture surrounding and complementing the designs displayed. 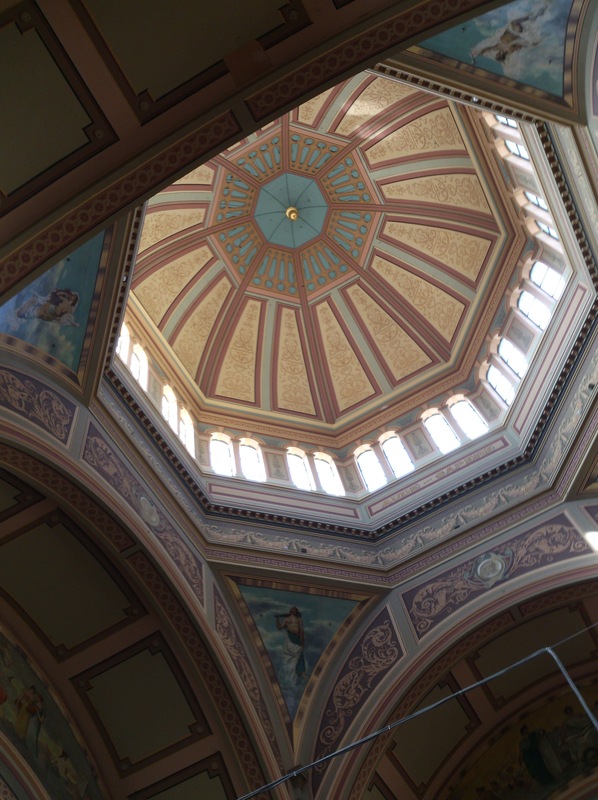 How wonderful for these high-domed ceilings and ornate walls to echo with the buzz of chattering visitors, exhibitors and enthusiasts explaining and discussing the delightful work on show. 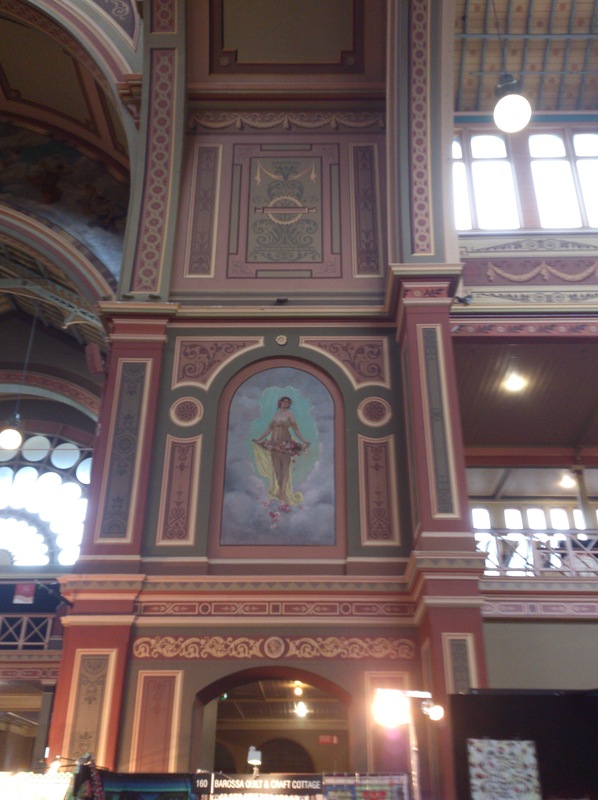 Paintings of cherubs and angels smile benignly at modern art and craft suppliers spruiking their wares. Experts in their craft conducting seminars and workshops, companies advertising the latest machines, demonstrating kits and finished products. Rooms off the main area filled with keen learners and experienced quilters glad of the opportunity to indulge their passion. And it is a passion. 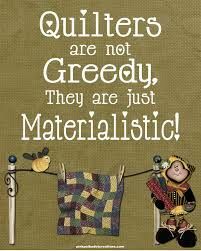 I loved hearing my sister’s expert commentary as she discussed the merits of exhibits, the level of difficulty, the immense skill necessary to achieve the desired result – and of course the difference between hand sewn quilts and machined quilts. I appreciated her enthusiasm because that’s what I feel about words and writing. 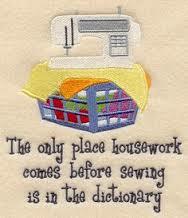 Cate has experienced complicated grief like me and as I turn to pen and paper, she picks up needle and thread. 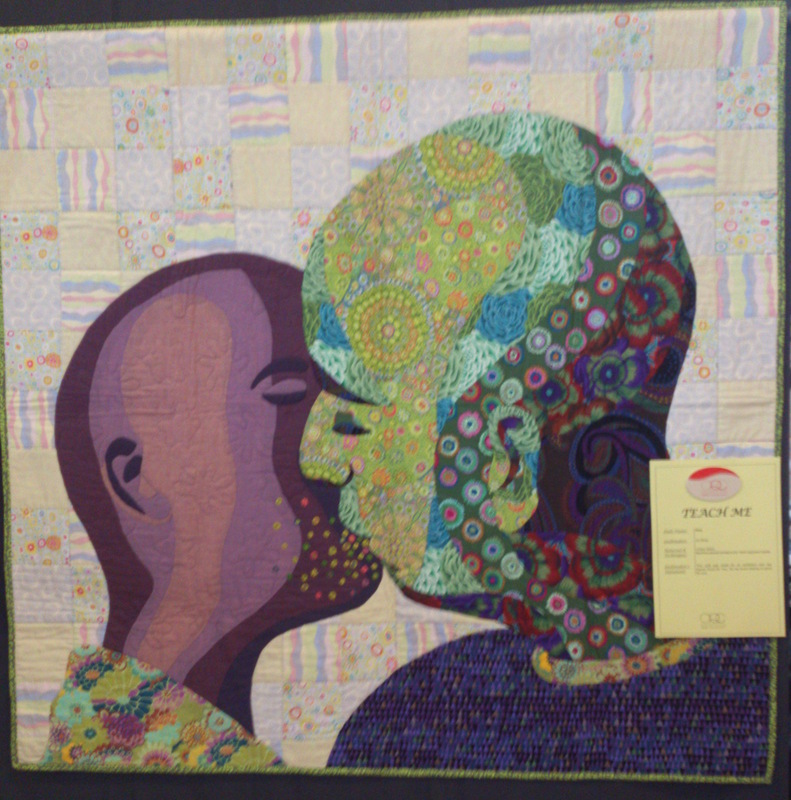 Many of the quilters submitted pieces they had started when diagnosed with breast cancer or were experiencing other trauma. Just as writing can be therapeutic, so can any form of art and craft. To ease pain by focusing on a project or labour of love instead of the grief or challenge is a good start on the journey of healing. 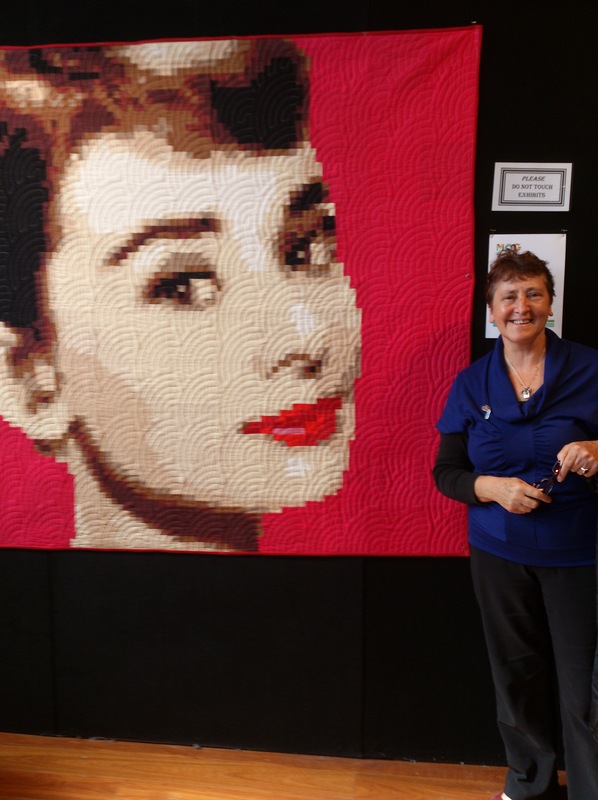 In 2009, when Mum was dying in Maroondah Hospital, a nurse suggested we place the beautiful quilt Cate had made for Mum on the bed, to remind her of home, and to brighten the harsh whiteness of hospital bed linen. 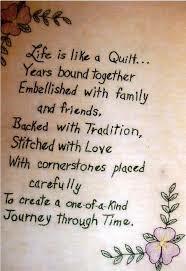 Memory triggered, I reminded Cate she had started making me a quilt to comfort me through chemotherapy in 2010. However, life can intervene, projects can remain unfinished or lose their focus, other priorities occur. If it arrives, it will be treasured, but as a writer I know all about the dips and curves and changing nature of creativity! No sign of sweat shops at this convention and plenty of laughter and intense conversations as people took respite in several cafes sensibly placed in corners. We too succumbed to the enticing aroma of fresh coffee, toasting bread, naughty fried food and sweet scrumptious desserts. Because of the record crowds we nipped across the way to the Museum thinking their cafe would have smaller queues. 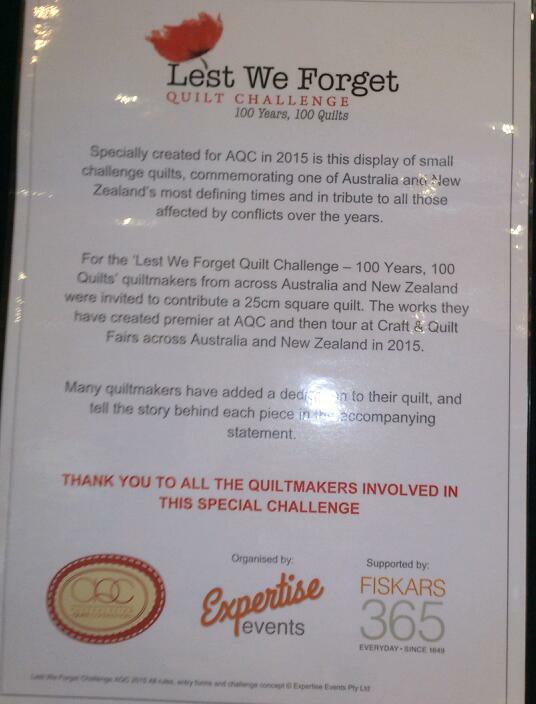 However, it was the opening of their WW1 exhibition so it didn’t take us long to rush back, flash our butterfly stamp at the gatekeepers and grab something to eat with other quilters. 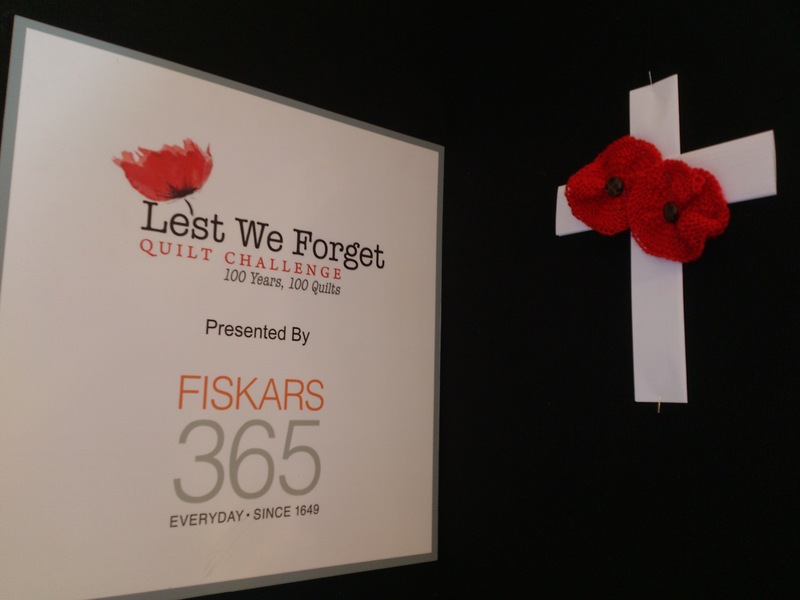 Of course, there was another gallery of quilts to show the spirit of the ANZACS and honour those who sacrificed their lives at Gallipoli. 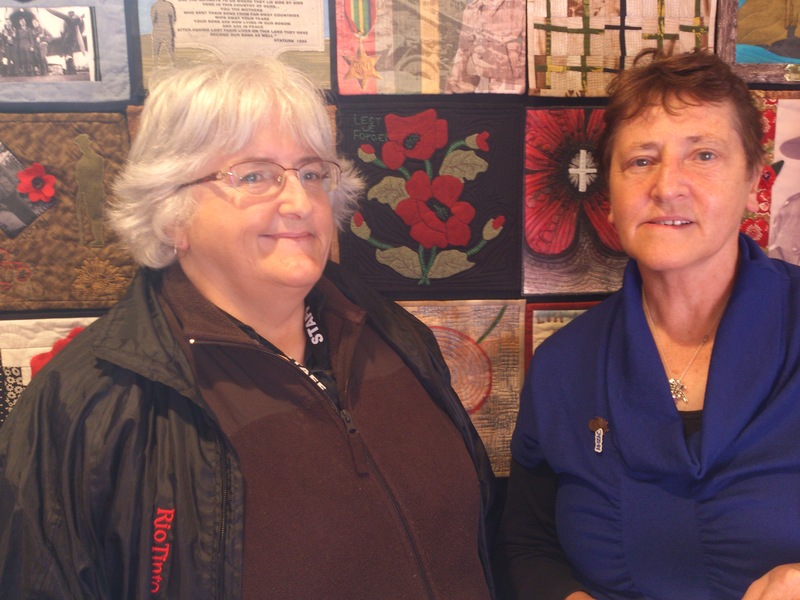 Jan Irvine-Nealie, one of the world’s most talented quilters honoured those early soldiers in beautiful quilts presented as a retrospective and Lucy Carroll’s Gallipoli Quilt honoured all soldiers moulded by the ANZAC tradition. But the exhibition wasn’t all about the Gallipoli Centenary – thank goodness – because in the last year we’ve been into overload in Australia with every aspect of the campaign and WW1 dissected and projected on our screens, at festivals, museums, on stage, at book launches, photographic exhibitions… You name the media and it’s been done. There were magnificent examples of work representing various interpretations of “True Blue”. I loved the variety. They reminded me of the astounding varied responses from the same writing prompt! To think these pictures are created by scraps of material and wool, hand stitches and machine – what patience and persistence, what talent! 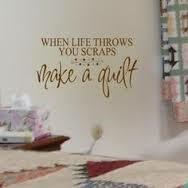 Intricate designs passed down through centuries and reinvented by modern quilters, William Morris influenced panels, interpretations and new creations showcasing the boundless expertise of Australasian quilters. 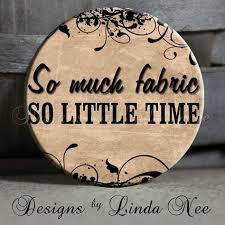 A comfort to me who has difficulty threading a needle nowadays never mind planning a masterpiece! 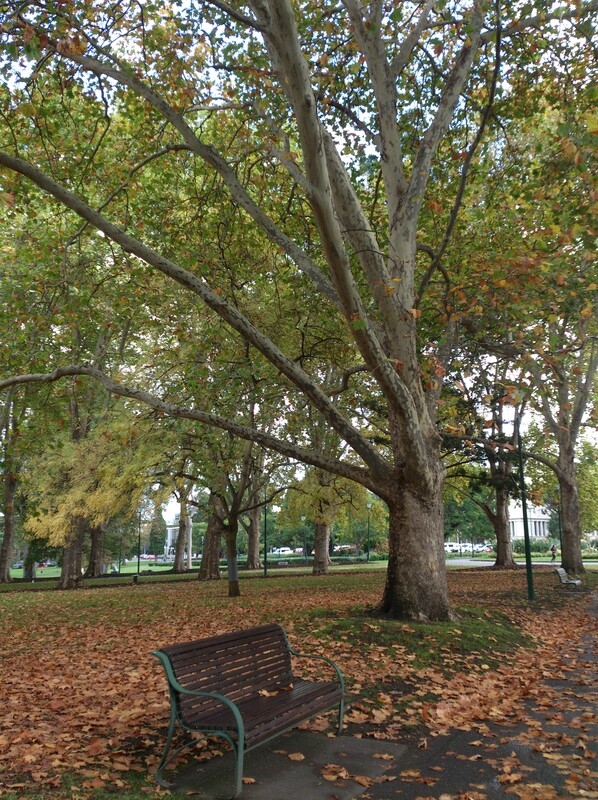 A truly inspiring day and one last look outside at the wonderful trees in autumn finery and my pocket notebook works overtime. Some days we are truly blessed to be with people we love and to experience the inspiring and creative qualities within our community. The following witty observations spot on! < Previous Memories are important, they help me understand who I am! Next > We will remember them… and celebrate their life and our links to the past!